Browse these categories to find the resources you need. Click on the red category links below to see the resources in each category. If you know the name of the resource you are searching for, you can enter it into the search box above. For more information on how to use these resources, see The Welcoming Journey. In our resource list, too, All can mean All. Resources appropriate for people with varying levels of comfort with and understanding of LGBT issues. Our most highly recommended resources for the journey from skepticism to widening the welcome to all our neighbors. 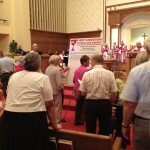 Links to other GLAD resources, allied welcoming church programs, and more resources. Resources to find support for your journey. Resources which focus on various formats or topics. Various resources focused on or for youth.